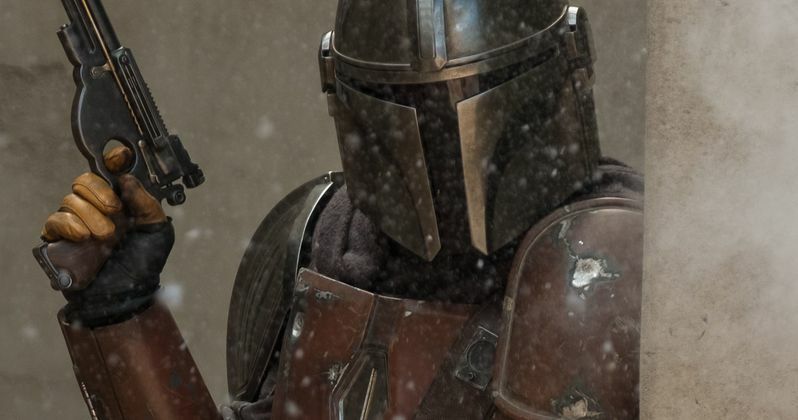 The Mandalorian looks even better than originally expected in new images from the upcoming series. In addition, the first official poster for the series has been unveiled. It was just announced late last week that the highly anticipated live-action Star Wars series will debut on November 12th when the Disney+ streaming platform officially launches all over the world. This means fans have this and The Rise of Skywalker to look forward to at the end of this year, with showrunner Jon Favreau promising a return to the feel from the first trilogy with his series. From the looks of things at Star Wars: Celebration, he was not kidding around. Today, Jon Favreau (writer/executive producer) and Dave Filoni (director/executive producer) hosted an informative panel discussion to an enthusiastic crowd on the upcoming Disney+ series The Mandalorian. They were joined by stars Pedro Pascal (The Mandalorian), Gina Carano (Cara Dune), and Carl Weathers (Greef) as they teased an early look at the first ever live action Star Wars series. You can see images of the aforementioned new characters below, along with the excellent poster. Footage from The Mandalorian was also shown at Star Wars: Celebration, but it has not yet been released online at this time. However, it will debut later today, so keep any eye out for the explosive footage that left some Star Wars Celebration attendees on the verge of tears. Pedro Pascal is reportedly awesome in the role, which isn't very surprising since he is great in pretty much everything he does. The Mandalorian isn't the only live-action Star Wars series coming to the Disney+ streaming platform. In addition to the release date announcement for The Mandalorian, Disney and Lucasfilm also finally confirmed they are developing a Rogue One prequel series that will debut within the first year of the Disney+ debut. The new series stars Diego Luna reprising his Rogue One character Cassian Andor and he is joined by Alan Tudyk as K-2S0. Stephen Schiff will serve as showrunner. People have wanted to see more K-2SO ever since the Star Wars spin-off hit theaters in 2016, so this is pretty big news and something that should help appease fans who are waiting for news about the two new trilogies being planned by The Last Jedi director Rian Johnson and Game of Thrones showrunners W.B. Weiss and David Benioff. The Mandalorian debut episode was directed by Dave Filoni, who also serves as a producer on the show. Other directors include Taika Waititi, Bryce Dallas Howard, Rick Famuyiwa, and Deborah Chow, which should help to give the show some dynamic changes and different feels within the first season as each director add their own personal touches to the Star Wars franchise. Frequent Childish Gambino collaborator and Black Panther original score composer Ludwig Goransson is on board to compose the music for the highly anticipated series. You can check out the images and the first poster from The Mandalorian below, thanks to the official Star Wars website.